In the movie, there are some secret agent type villains that all appear to be identical to one another. They also repeat everything one of them says, like an echo. 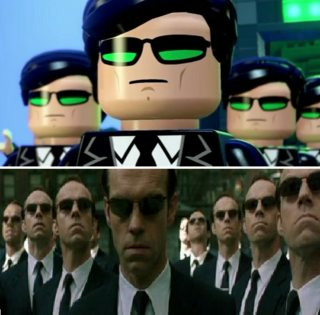 They remind me of Agents from The Matrix, but LEGO has no prior relationship with that property so I'm not certain. As noted in comments, The Matrix is a WB property, so it could be them. However, most of the other villains we see have already had appearances in other LEGO media, namely The LEGO Dimensions video game and related sets. All the articles I've found (so far) only speculate that they're Agents, but I've not seen any confirmation. Unfortunately, I didn't get to check the end credits to see if they were named there. Who are these bad guys, and what property are they from? Those were Agents Smith(s) from the Matrix franchise. Q. You even included the Gremlins. Yeah, Gremlins and Agent Smith. And Warner Bros. bought the MGM library, so they’ve got the Wicked Witch. But also, the one reason why I can’t do Kathy Bates or Moriarty is less about the rights holders and more about the fact that it would be hard to sell who that character is easily. I’d already crammed it with a bunch of Rogues Galleries and we’ve got a lot of main characters and a lot of characters that we want to hear more from, so at a certain point it became like, okay, how many obscure characters can we fit in and people understand who they are. At one point I had HAL from 2001 in there. I just wanted to throw as many in there that I possibly could. There was ones that I wanted to do, like maybe put Moriarty in there from Sherlock Holmes, but it's just a hard read. Some of them are just so visual that you immediately get who they are or at the very least that they're a bad guy. The Agent Smith is probably the closest thing to Moriarty, but it's just such a distinct performance thing and a visual look to it. We could do sort of the thing with one guy turning into three of them that even if you don't know those movies, you just sort of get it. Why were New Paradigm “British Robots” featured in The LEGO Batman Movie? Who are the villains in this picture? In Lego Batman, where is Zod? Do the events in the Lego Batman movie take place in the same universe as The Lego Movie? In the Lego Batman Movie why did the writers choose the phrase “It takes a village”? Where does The Lego Ninjago Movie fit in the LEGO timeline? What is this Union Jack with a “QR” inscription in the Lego Ninjago movie? Can Lego characters die in the Lego Cinematic Universe? Does The Lego Batman Movie take place in between The Lego Movie and The Lego Movie 2?